How to Clean Your Wrist Braces? iCliniq › Ask a doctor online › Health Articles › Wrist Brace › How to Clean Your Wrist Braces? People take every precaution to protect their heart, lungs, kidneys, brain, eyes, ears, mouth, etc. Wrists are one part of our body that we forget, until it starts hurting. We take care of our hands. But our hands are useless if our wrists are not functioning. Once the wrists start giving trouble, people realize the importance of their wrists. Most of the time when we realize the importance, the damage is already done. There are eight carpal bones in each hand. The bones are in two rows. These two rows form the bottom of the carpal tunnel. Ligament is a very sturdy tissue which covers the top of the carpal tunnel. All the eight carpal bones are connected to the one next to it with tiny ligament. The base of the palm where the forearm and hand get connected is the carpal tunnel. Nerves and tendons pass through this tunnel. The blood supply to the hand goes through this tunnel. The tendons which help us to move our fingers run through this tunnel. These connect the muscles of the forearm to the fingers. The tendons are covered with a greasy fibrous tissue named synovium. Synovium swells when the wrists suffer damage. I had ulnar nerve relocation surgery.Could that be the reason I am having wrist pain? Is it a must to avoid Diclofenac during pregnancy? Please comment on the severity of my wife's wrist x-ray. Uncomfortable positions, static postures, tedious jobs, excess stress without an interval are the main causes of repetitive motion injuries. The pressure within your wrists depends on the way you keep your wrists. If the wrists are in a neutral or a straight position the pressure is at a minimum. When the wrists are moving forward and backward the pressure increases within the carpal tunnel. When your wrists undergo stress due to awkward positions or undue pressure, the tissues in the carpel tunnel can become damaged. If there is an interval to the usage, the body automatically rebuilds the damaged tissues. But if the wrists are undergoing stressful conditions without a break continuously, then symptoms may occur. Wrists start paining due to carpal tunnel syndrome, tendinitis, hand fatigue and arthritis. How Do Wrist Braces Work? The wrist braces are one easy solution to your tired wrists which suffer. A wrist brace (or splint) helps you keep your wrist firm and still being able to move without restrain. It also helps to reduce the pressure on the median nerve. Furthermore, the wrist braces give comfort to the pain which makes the movements difficult. The wrist brace is a short term remedy for carpal tunnel syndrome. Long term use of wrist braces may weaken the wrist muscles. You can avoid this by exercising your wrist muscles after using wrist braces. It is always good to remember that wrist brace is not a replacement for the missing ergonomics at your work place. A good, wrist brace will put you at ease, last a long time, and easy to put on and remove and also easily washable. Also, it must help to hold the wrist in a neutral position and also confine to comfortable wrist movements while restricting difficult hand movements. Wrist braces can be easily bought at the drug store or pharmacy without a prescription. Sometimes the wrist braces are custom made for each person. This allows you to get wrist braces made for you with lightweight materials. This makes wearing a wrist brace more comfortable and less clumsy. To get a custom made wrist brace, an order will have to be placed through your physical or occupational therapist. There are different types and sizes of wrist braces available now, as per your need. 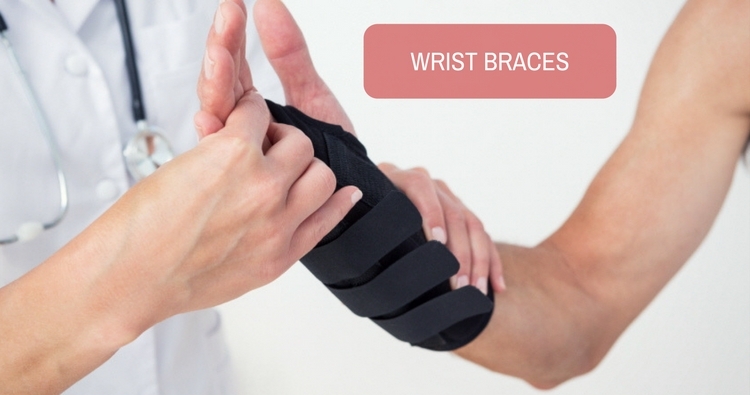 The type of braces needed will depend on which structures are damaged in your wrists. There are wrists braces which give high protection level, medium protection level and low protection level. The high protection level braces are made of plastic or metal. They place foam or a soft material inside to make it comfortable to the user. These are usually used for patients with severe conditions. The medium protection level is usually made out of neoprene which gives comfort and warmth to the user. For users with carpel tunnel syndrome, they use a metal splint embedded in the front side of the wrist braces. The velcro fastenings allow the braces to be adjusted accordingly. Simple tube-grips or neoprene supports are used as low level supports. These usually do not cross the wrist to the hand. This allows the free movement at the wrist joint. These are usually used for heat retention and compression to reduce swelling. They are also available in universal standards which one fits anybody. There are wrist braces which can be used for both left and right hands (reversible). Some wrist braces are equipped with wooden beads which touch your skin and it helps the wrist to get the comfort of a massage in wearing the wrist braces. Anything that is worn on your body get soiled and dirty regularly. Your wrist braces may become dirty by sweat, dust, food droppings and from dirt on the surfaces it touches. You need to apply the same hygiene rules which exist for other clothing you wear to your wrist braces as well. Wearing clean braces can avoid bad smell, infections and skin rashes. It is best to hand wash, with warm water and a mild soap with a disinfectant. This will be the easiest way to keep your wrist braces clean. Always close the straps prior to washing. Also read the instructions which come with the package or the label of the wrist braces, about machine washing. Most of the wrist braces available right now in the market cannot be machine washed, tumble-dried nor dry cleaned. Unless specifically mentioned on the label do not use bleach or fabric softeners to wash either. If there are metal splints, plastic pieces or wooden pegs attached to the wrist braces, always remember to remove them prior to washing. After washing, the wrist braces, rinse well and air dry. Do not keep it under a radiator or out in the hot sun. It must be remembered not to use an oven or microwave to dry even in an emergency. Because it alters the shape of wrist brace and does not maintain the normal alignment of wrist joint. It may hamper the healing process. Some times it shrinks and does not fit to the affected area. It does not provide stability to wrist joint also. There are times that you are requested to wear your wrist braces without removing them for longer periods. This may cause a problem for you since you will not be able to have them dried after washing. Washing and air drying takes at least minimum of five hours. Therefore, wearing the wrist braces for longer time may lead it to start smelling and you may find it difficult to adjust to the smell. Also, going to public places wearing a wrist brace which is smelly may be very embarrassing. To overcome this people sometimes use a wrist sock underneath their wrist braces. You can have one or two wrist socks to change daily. If you wash the wrist sock daily, you will not have a smelly wrist brace. Also wrist sock will avoid the sweat getting into the wrist braces. While gardening or cleaning, always wear rubber gloves over the wrist braces to avoid the braces getting dirty. If the instruction on the wrist brace label indicates that it can be machine washed, remember to place the wrist braces inside an old pillow case or a clothes bag or a cushion cover before putting it into the washing machine. This will avoid the velcro on the wrist braces getting stuck inside other clothes in the washing machine. If you have food spilt over your wrist braces, you can use a wet towel or a wet sponge to remove the stain off the wrist braces temporarily till you get a chance to wash it properly. If the wrist braces are not that costly, for better hygiene you can buy two wrist braces to change daily. Always remember not to use any chemicals while washing the wrist braces because it may damage the elasticity or the material. Sometimes, the color may run and it will look worn out. Always it is best to look at the label before you buy the wrist braces for cleaning instructions. The wrist braces you buy depend on the extent of the damage to your wrists and the recommendation of your therapist. But currently there are different types of wrist braces available in the market and it is best to choose the best wrist brace which you can maintain depending on the work you do and the climate you are in. Sometimes, it is best to understand your allergies and inform your therapist of these conditions before getting the prescription. Wrist braces provide you the remedy for very uncomfortable wrist conditions. But maintaining the wrist braces may worsen hygiene conditions much worse than your wrist condition if one is not careful. Therefore, always be aware that keeping your wrist braces in a clean state is always advised.You need to consult a therapist after using the wrist braces for the prescribed time. Wrist braces may not be the remedy for all wrist ailments. Therefore, sometimes if the pain has not healed, the therapist may recommend a surgery. Do you have a question on Wrist Brace or Wrist Pain? Is it serious to have tingling sensation in hand?